Named after the Earl of Leicester who owned a large plot of land with a flash house that he enclosed preventing people access to previous common land. The public were rather cross with this situation and asked King Charles I to intervene. He asked the privy court to arbitrate. The court waved its authoritative finger at the Earl and gave a part of the his land to the public. This area known as Leicester Field became popular for entertainment. Now famous for movie theatres and red carpet star studded opening nights. The square is undergoing major renovations at present so I have taken the above picture in the area known as the Swiss Court. Shown is the Cantonal Tree. 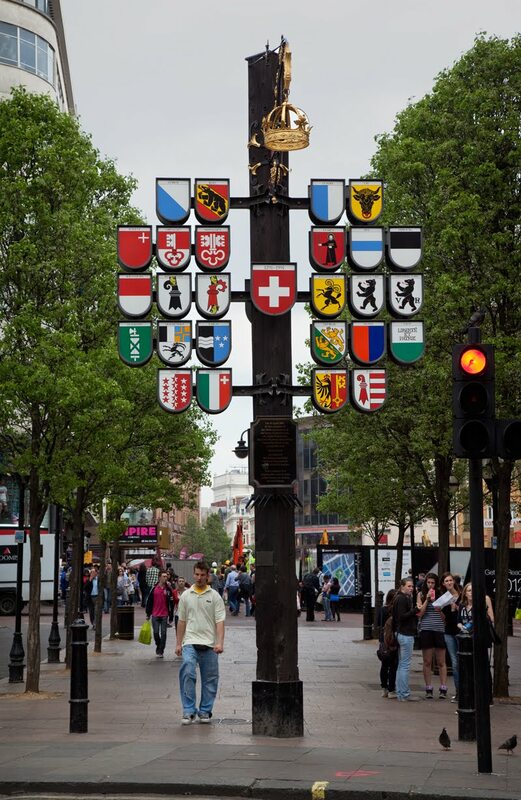 Erected in 1991 as part of the 700th anniversary of the Swiss Confederation as a token of friendship between Switzerland and the United Kingdom. The tree bears the arms of the twenty six cantons of Switzerland. I hope the renovations end up with something interesting. I used to like visiting the old Swiss Centre, and I'm sort of hoping there will be something clockwork there. Meanwhile I love your picture. I love your picture too. Leicester Square always makes me think of 'Cry Freedom' because we went there twice to see it. The Canton tree is superb. So colorful. That is so bright and attractive. Will renovations and rebuilding in London ever finish, I wonder? Yea! A location I've been to! I found it to be so pretty. I think we stood there for a good 5 miles just looking at it. I have a similar image too. Thanks for the smile!